A beautiful set of wireless spots ready to light up your night. 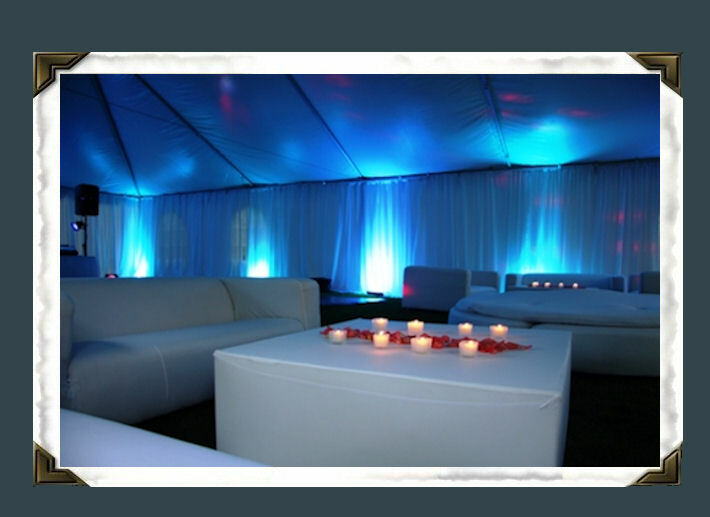 Need to transform that room or venue? Caught up in the "everybody's doing it" with regard to uplighting? Well, there's certainly no shame in it! Whether you're looking to place focus on a specific area of your room such as the head table, or if you're simply choosing to create a colorful atmosphere to help develop your dream evening, uplighting can be the answer. Turn the plain into magical and "paint" the room in colors that match your ideal look! For a LIMITED TIME ONLY, prices have been reduced for a short term promotion. ALL 12 BEAMS OF UPLIGHTING are yours for $200.00!! TRY to find that kind of pricing on uplighting. These prices will not last so take advantage now!! Original prices are listed below and will return soon. 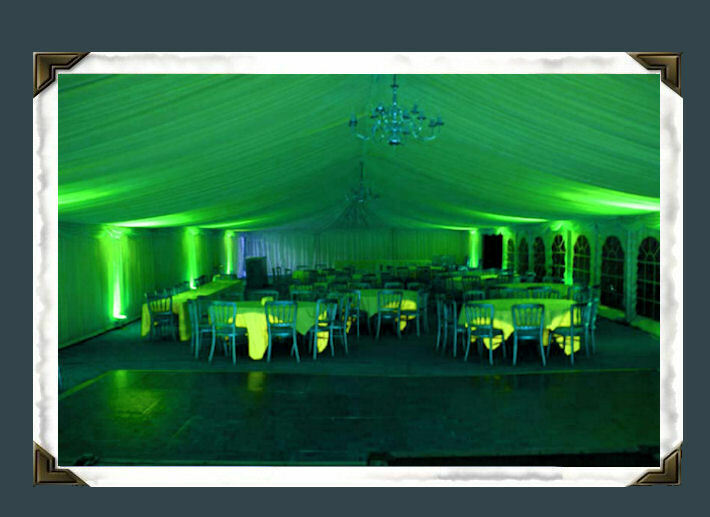 Regardless of what type of event you're putting together, uplighting can enhance your room and bring aspects of the room, if not the whole room to life. You have several options to choose from depening on your needs. Work with Sean to design your evening in full color and literally bring your ideas to light! Engage your guests' attention by applying focus on a specific area of your room with 4 beams of uplighting. This is a great option to enhance the attention to a specific location such as the head table, cake table or other specific area in need of attention. Select this simple, yet chic option option for $150.00. Needing a bit more light and color? Raise the bar a notch to 8 beams of uplighting to enhance multiple areas of your room or a smaller to medium sized room in the event you're going with an intimate to mid-sized setting. The 8 beam package won't fill a large room but can provide focus to areas of your room that needed a boost of color and this option is yours for $225.00. If you're looking to create a colorful atmosphere, you'll want additional coverage with 12 beams of light. This provides your medium sized to larger rooms with solid coverage of light and color. Bring your room to life by decreasing the space between lights and applying a more symmetrical feel to the room. Turn your work of art into a masterpiece with enhanced lighting coverage for $350.00. 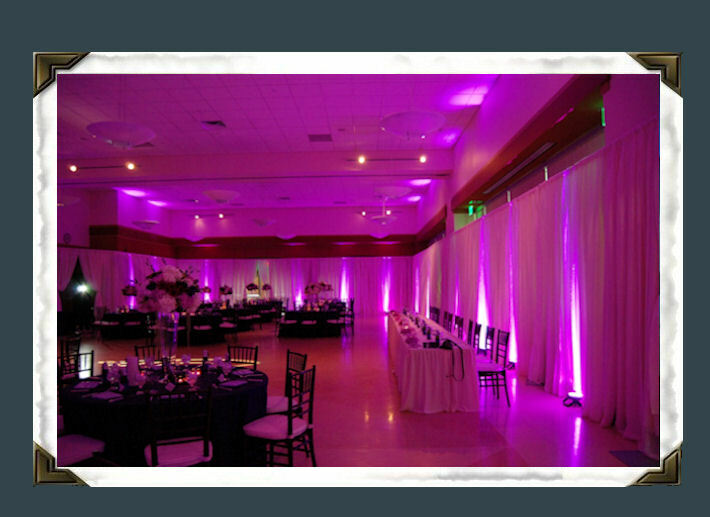 Please note that uplighting services will be designed to produce a solid lighting color or mix of colors depending on your preferences. Additional requests such as color changes, movements or ideas requiring programming or control needs may require an additional service fee.